Do you thrive on challenges and achieving results? Would you like to begin a career with a company that encourages you to make immediate contributions, to be a leader in client relationships, the profession, and the community? Would you enjoy working for a firm that compensates you accordingly and provides the benefits, training, and resources that enable you to reach your personal and professional goals? If so, Sciarabba Walker & Co., LLP would like to hear from you. We recruit ambitious individuals who share our vision as the active professionals and can work effectively as part of a skilled and dedicated client team. We believe that everyone contributes to our success, from interns to senior partners. Because of this, we are committed to making work here both personally and professionally rewarding, including opportunities to develop at every stage in your career. 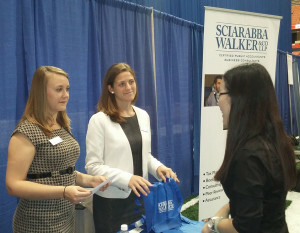 Whether you are a college student seeking an internship, an accounting graduate, a CPA, MBA, or other professional looking for that next step on your career path, we encourage you to apply for current and future employment opportunities at Sciarabba Walker. Sciarabba Walker is an equal opportunity employer.